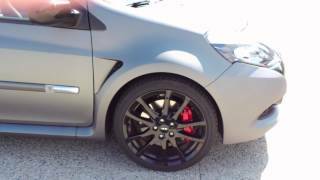 Renault released 40 units of its limited edition 2012 Clio RS Angel & Demon in Australia on the eve of Valentine's Day this year with a total number of 666 units released in 15 markets worldwide. This new and rather naughty variant of the racy RS 200 hatchback comes with new look, interior and various performance enhancements. The name, Angel & Demon, may seem rather weird for a car (actually it is), but Renault has perfect reason for naming the car in such a manner. This is the first time Renault has released any vehicle in two different matt colors – one is demonic Toro Red and another in angelic Hologramme Grey. This is the reason they have named this special edition hatch as Angel & Demon. On the outside, the contrasting colors of the cars have been combined with glossy black on the roof, rear spoiler & diffuser, upper tailgate, handles, doors, mirror caps, and on its F1 style front bumper. Apart from these areas, this glossy black treatment has also been given to the 18-inch Interlagos alloy wheels, which have Bridgestone RE050A tyres surrounding them. This is the same tyre that was used by the Megane RS Trophy in its world famous run at the Nurburgring circuit. Under the hood, the Angel & Demon is powered by the same 2.0 liter Sport Engine, with a maximum output of 151kW and a peak torque of 215Nm. On the inside, the Angel & Demon sees most amount of change. It comes with Recaro leather bucket seats, metallic gear knob, RS monitor telemetry system, climate control system, red steering wheel stitching as well as individually numbered plaques. The car also comes with multiple connectivity options, which include Bluetooth, and a multimedia connection box. In Australia these cars have been priced at $39,990 with deliveries slated to start from this month. 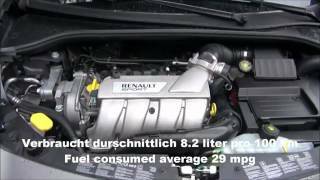 Renault Sport is launching Renault Clio R.S. “Ange & Démon”, a limited series of Clio R.S. with the celebrated Cup chassis and a wicked array of equipment. It also innovates with two matt body colours, a first for Renault. Unique features include matt paintwork, a black roof, black 18-inch alloy wheels, Bridgestone RE 050A tyres and leather-upholstered Recaro bucket seats. A fiendish 666 units will be sold worldwide, with orders opening on September 30 in France. Price in France: €27, 990. Clio R.S. “Ange & Démon” will be presented at the Lyon Motor Show (France) from October 7, 2011. The first vehicles will be in the showrooms for Halloween. 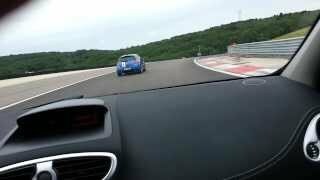 Jean-Maxime Boulanger, Product Manager for Clio Renault Sport, confesses: “The Clio R.S. 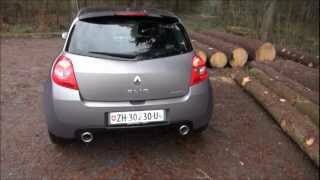 “Ange & Démon” is a version of Renault Clio R.S. that exercises an instant attraction. Clio R.S. “Ange & Démon” illustrates a series of “firsts” for Clio. Real matt paintwork with Matt Hologramme Grey will be joined later by Matt Toro Red. The more sober Givre Nacré is also available in the line-up. These colours complement the gloss black roof, upper tailgate, rear spoiler, rear diffuser, F1-style blade in the front bumper, the door handles and exterior door mirrors. The rear side and tailgate windows are dark-tinted. The gloss black 18” Interlagos wheels, as seen on the late Mégane R26.R., show the red Brembo brake callipers. The wheels display the R.S. badge in the centre and are shod with Bridgestone RE50A tyres. On Mégane R.S. Trophy, these tyres contributed to the record set by Renault Sport on the Nürburgring Nordschleife. The warm interior ambience contrasts with the deliberately cold effect of the exterior. The driver is welcomed by the leather-upholstered Recaro bucket sites. The unique metal gear lever knob provides a good grip. Next to it, a numbered plate sits quietly under the hand brake. The cabin features a full range of comfort equipment including a hands free card, a Bluetooth® Plug & Music radio, automatic climate control, protective floor mats, and electrically-folding door mirrors. 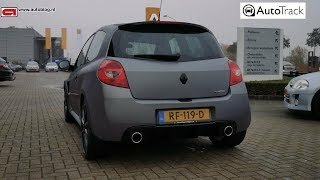 Customers buying Clio R.S. “Ange & Démon” can choose between the R.S. Monitor option – Renault Sport’s onboard telemetry system– or the built-in navigation system Carminat TomTom Live® at no extra cost. Last, an “Ange & Démon” logo on the left hand side of the rear quarter window pillar identifies this limited series, which will be released in 666 units worldwide.